Have you seen Trolleybuses? These were the earliest means of transport and these buses have been in existence from 1882. Currently there are less than 300 trolley buses in existence. These vintage trolley buses have been given a makeover by the artist, Liudas Parulskis . Vilnius which is the capital Lithuania, has a fleet of buses and to celebrate the 4th Vilinus Street Art Festival, the cities buses have been made to look like part of the street which gives an amazing camouflage effect. You can also find a wolf crossing the road, which is considered as a spirit animal, which is supposed to bring good luck. Vanishing Trolleybus has a picture of the perspective of the street printed on both of its sides and once a day while crossing Tumo Vaizganto street and Gediminas Prospect intersection it “dissapears” by camouflaging itself into the landscape. 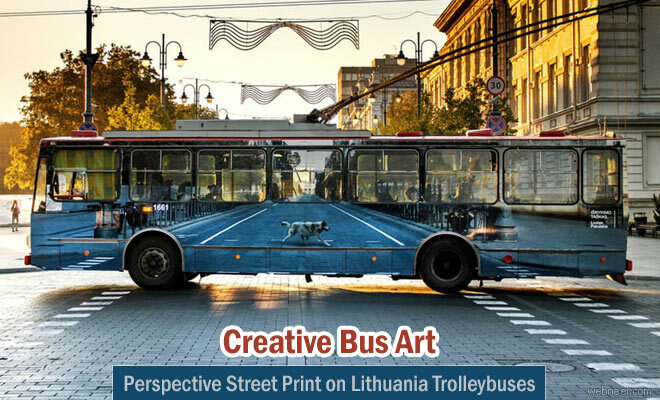 Lithuania is well known for it's mazing architectures and recreating the artwork into the the trolleybuses adds an interesting insight into the culture of the Lithuania.